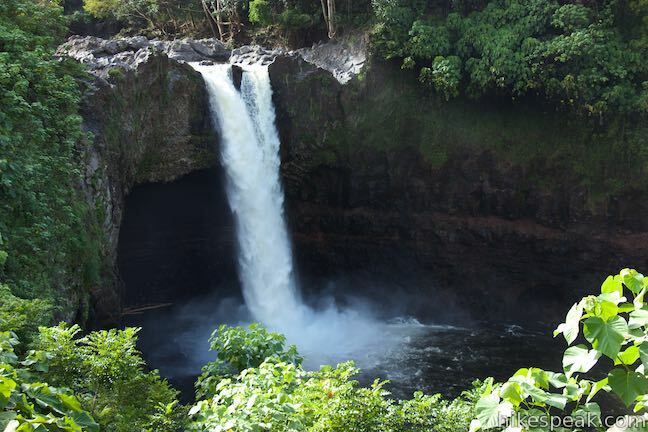 A mile and a half from downtown Hilo, the biggest city on the Big Island of Hawaii, Rainbow Falls pours over a basalt ledge in Hawaii’s longest river. The 80-foot tall waterfall takes a broad single-drop plunge. 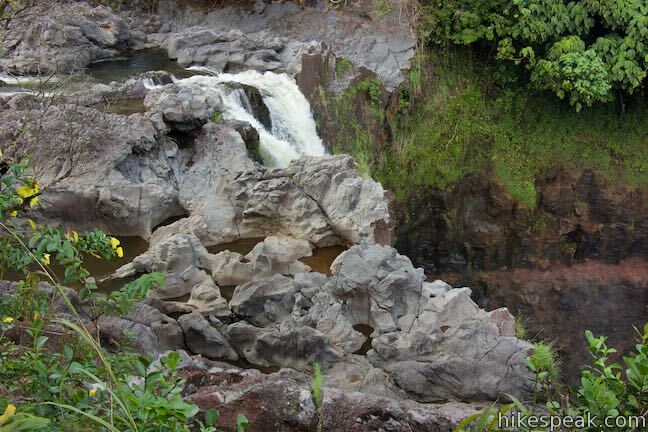 Visitors can see Rainbow Falls (and hopefully a morning rainbow) from Rainbow Falls Lookout in Wailuku River State Park, where 0.2 miles of lets-be-generous-and-call-it-hiking leads to one viewpoint facing the waterfall and another perch alongside the top of Rainbow Falls. 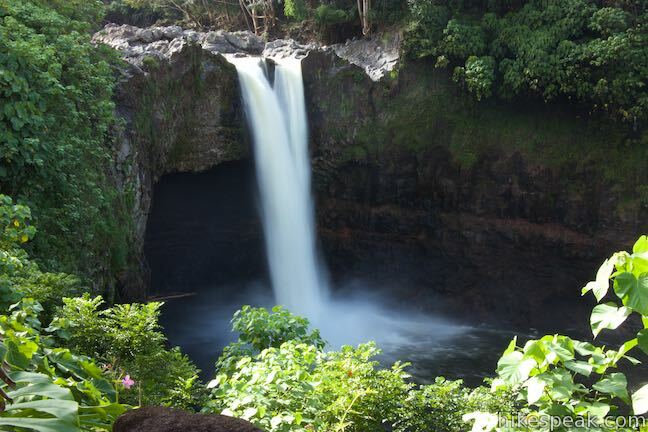 With minimal effort and plenty of beauty as reward, Rainbow Falls belongs on the itinerary for every trip to Hilo. 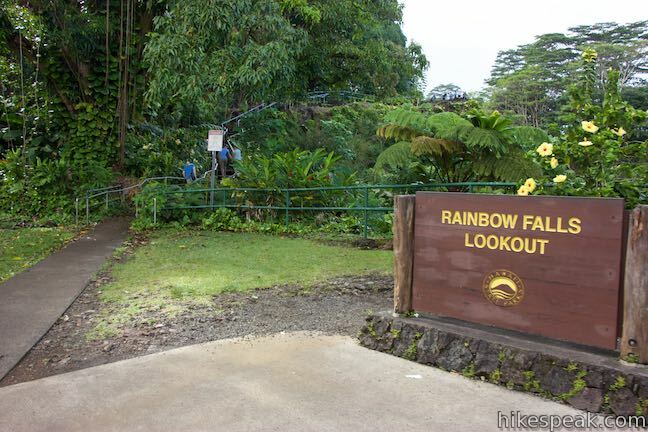 Pull up to the parking area for Rainbow Falls Lookout, nestled within the city of Hilo, just 1.5 miles west of it’s coastal downtown. Straight ahead of the parking area is a 70-yard long viewing area facing Rainbow Falls. A paved ramp and walkway makes this area of the park wheelchair accessible. 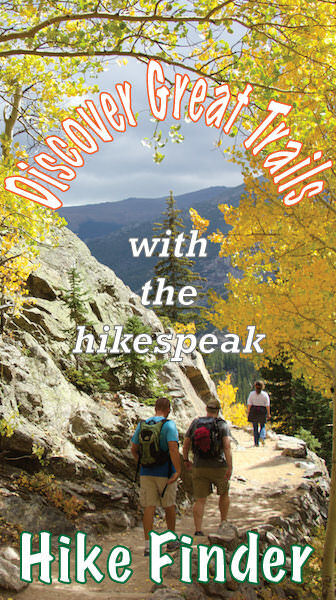 On your left as you face the waterfall, spot another trail packed with rock slab steps that rise to the brink of Rainbow Falls. 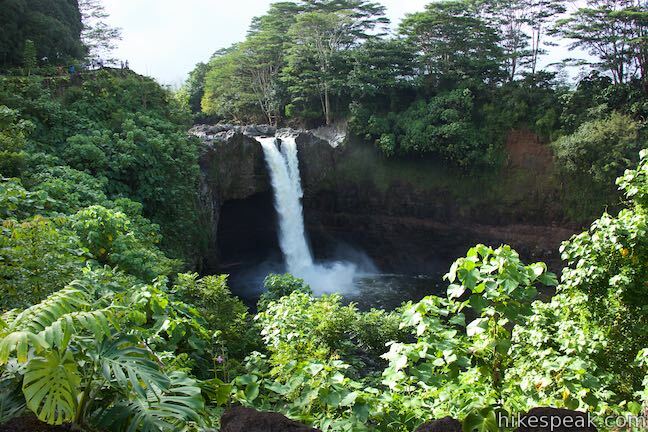 The waters of the Wailuku River drop 80 feet (24 meters) to create Waiānuenue or Rainbow Falls. Plunging in front of a natural lava cave created by the powerful splash back, the water falls into the large pool below. The width of the waterfall increases during periods of heavy rainfall. 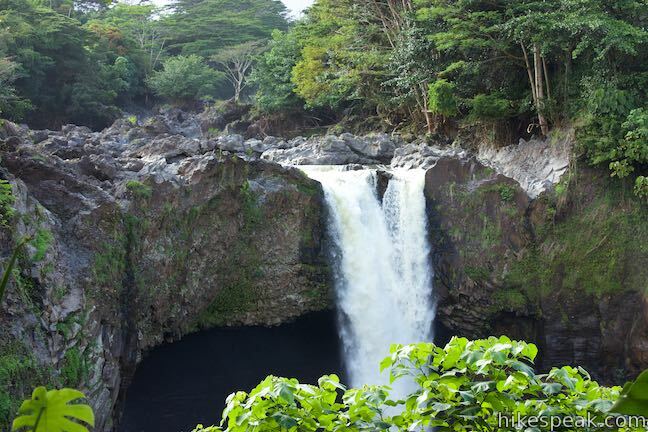 According to Hawaiian mythology, the cave in the overhang behind the waterfall was home to Hina, the mother of demigod Maui. 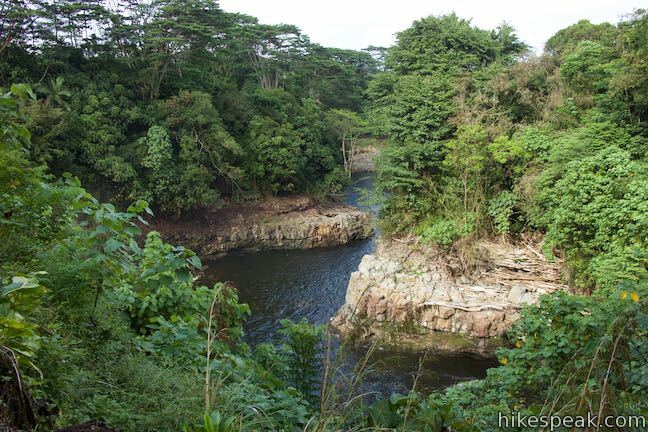 A giant lizard named Kanu tried to drown Hina while she was in the cave, resulting in a epic battle with Maui in the Wailuku River. 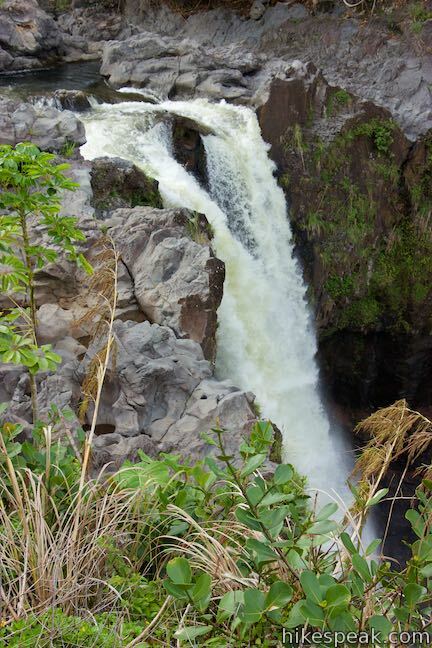 Rainbow Falls might be a shorter beauty, but the volume of the river gives the waterfall heft and significance. Once you have taken in this perspective of Rainbow Falls, backtrack toward the parking area to venture up the next trail, which is steeper and slightly longer. 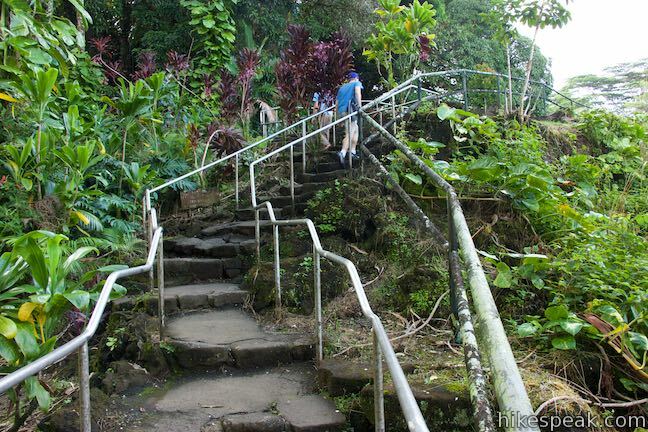 Leave the parking area again and begin up rock steps that ascend the slope south of Rainbow Falls. 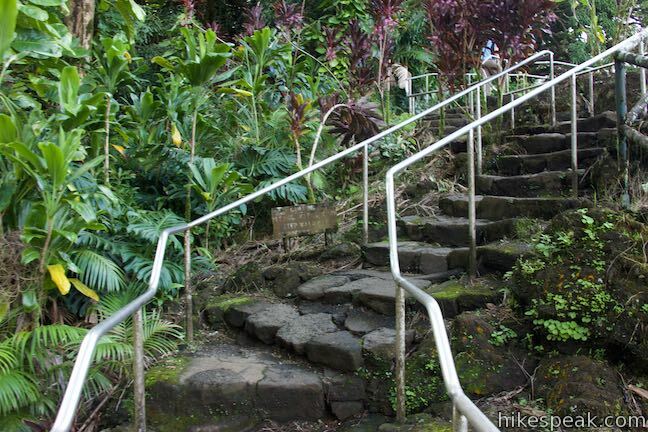 Metal railings along the staircase assist with the climb. 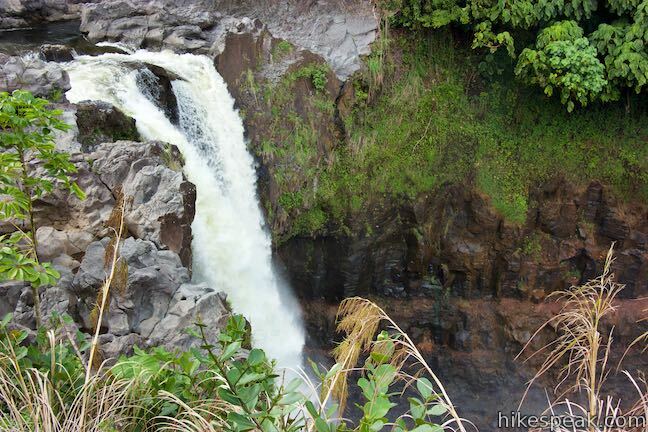 After around thirty steps, the trail levels out atop the basalt ledge beside Rainbow Falls. 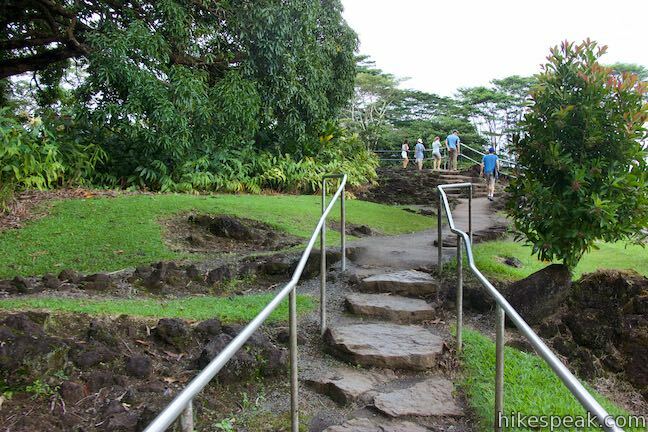 Walk up to the railing at an overlook by the brink of Rainbow Falls. Watch the waterfall pour over the edge of the jagged basalt ledge. Look down on a pool that extends to the right, below the viewing area where you just stood. 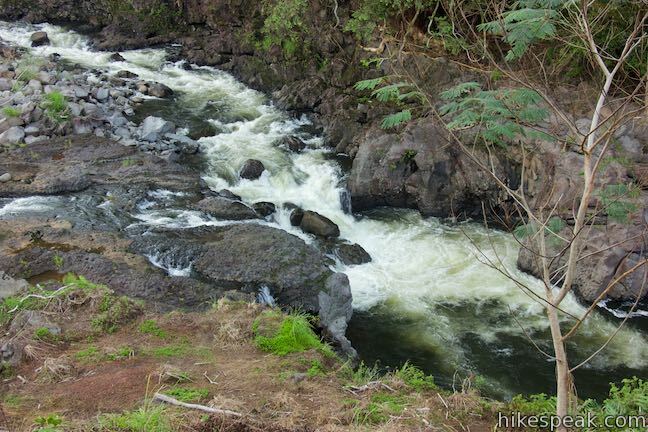 Wailuku River makes its way past the pool to the left on its course to the coast. The exposed banks of the river signal just how much higher the water level can get. The most interesting thing about the top of Rainbow Falls might not be the waterfall itself (you get a better view from the lower viewpoint). 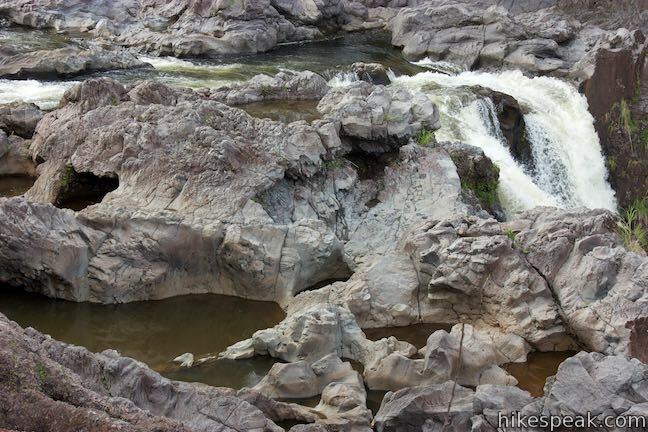 Instead, it is the wild depressions and pools in the riverbed surrounding the top of the waterfall that draw your attention. 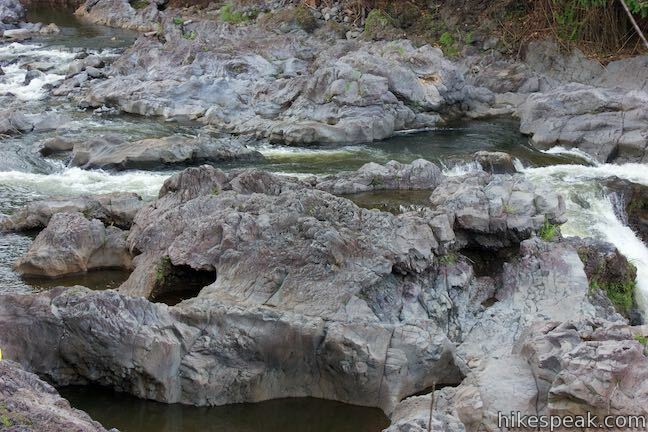 The basalt surface is full of strange pockets and other shapes. The trail end at the top of Rainbow Falls. 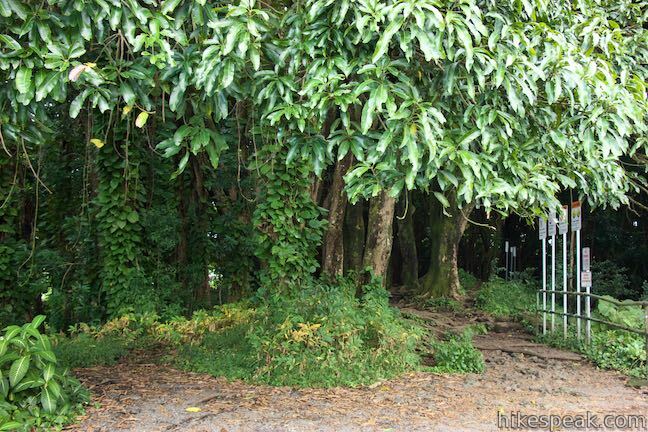 Footpaths continue upriver through a grove of banyan trees, but this area appears to be off limits. Flash flooding and rapid rises in the river have proven deadly, so exploring beyond the trail has risks. 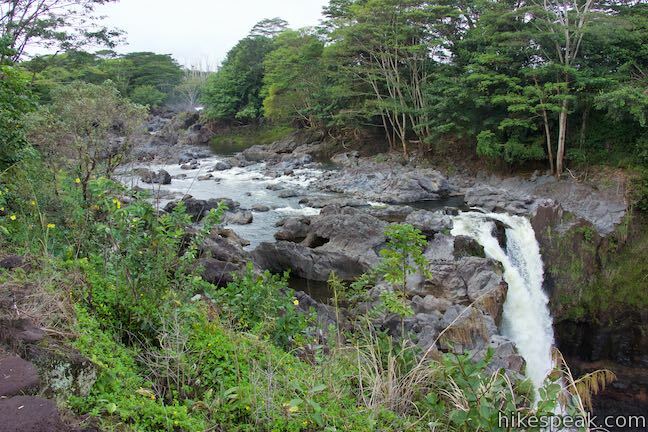 Once you’ve seen the top of Rainbow Falls and gazed up and down the river, follow the step-packed trail down to the parking area to complete this 0.2-mile round trip hike with 40 feet of elevation change. Dogs and bikes are not allowed on this outing. 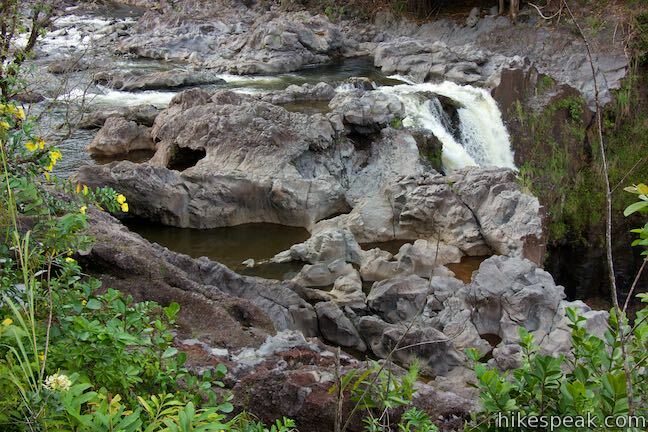 Parking at Rainbow Falls Lookout in Wailuku River State Park is free, so get out and enjoy! 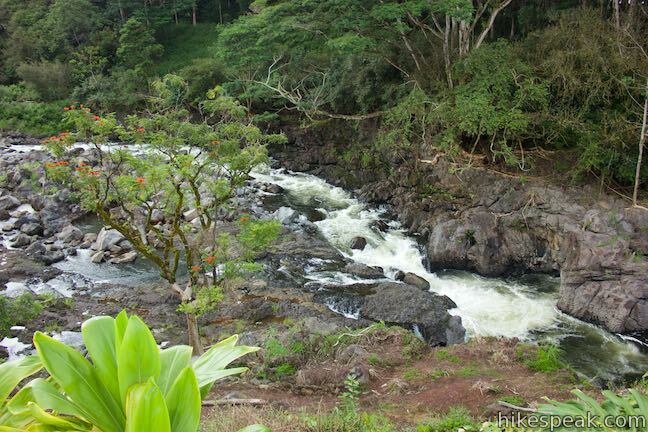 A short distance up the river from Rainbow Falls Lookout, find Boiling Pots Lookout positioned over an area of the river made up of pools resembling boiling pots. 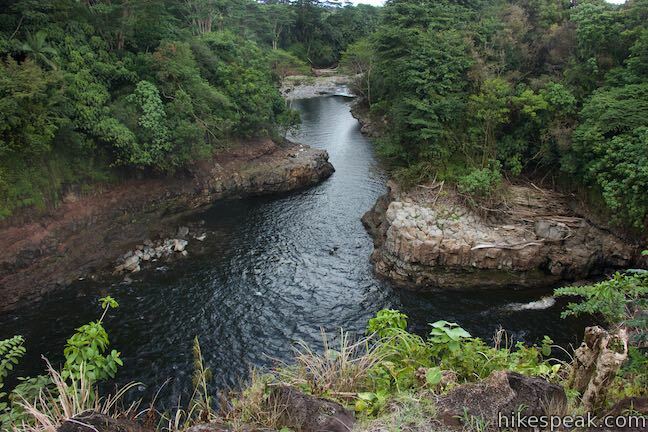 Some people like to use these pools as swimming holes during the right conditions. 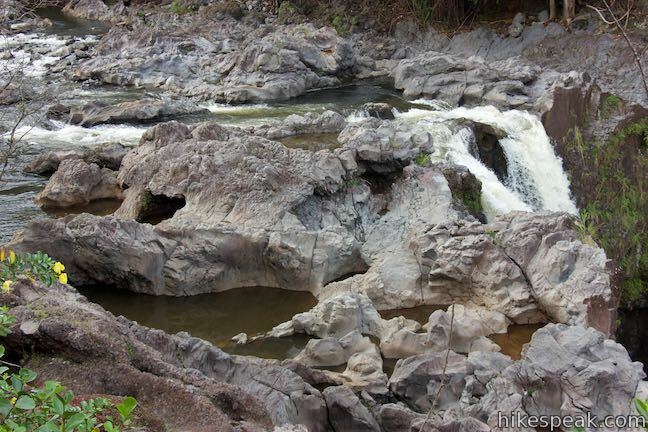 Wailuku River is prone to dangerous flash floods (the translation for Wailuku is “waters of destruction”). Observe all barriers and signs. Want to see another waterfall? 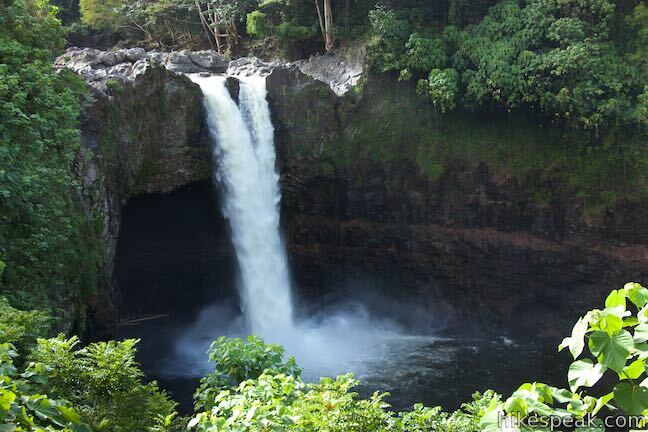 Check out nearby ‘Akaka Falls, which is 5.5 times taller than Rainbow Falls. 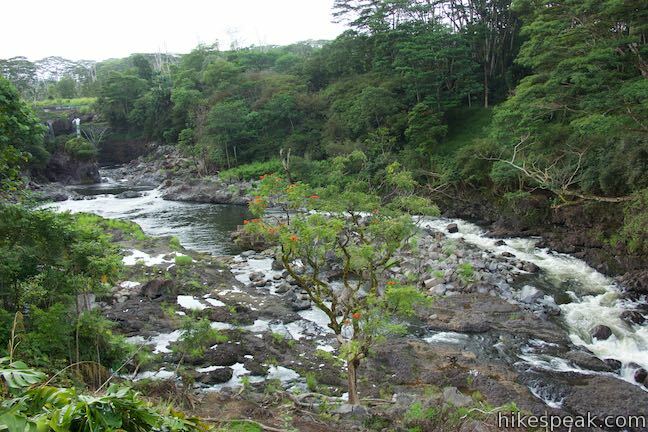 To get to Rainbow Falls Lookout: Take Hawaii 19 (Hawaii Belt Road) to the center of Hilo and head inland on Waiamuenue Avenue. 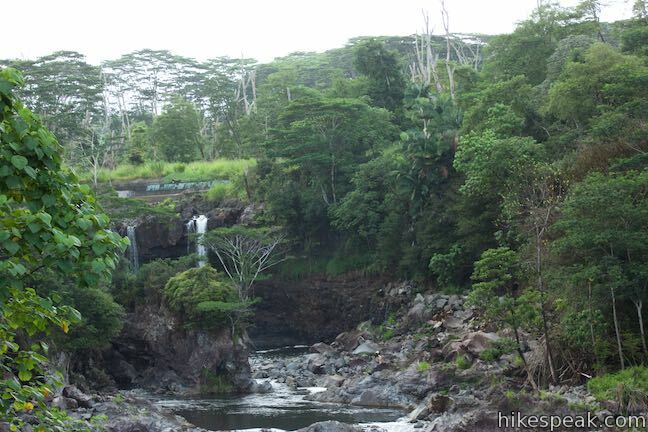 Drive 1 mile and stay right through a split with Kaumana Drive to continue up Waianuenue Avenue, following signs for Rainbow Falls. (Kaumana Drive proceeds toward the Kaumana Caves). Drive another quarter mile and turn right onto Rainbow Drive. The parking area for the lookout is on the right after another quarter mile. 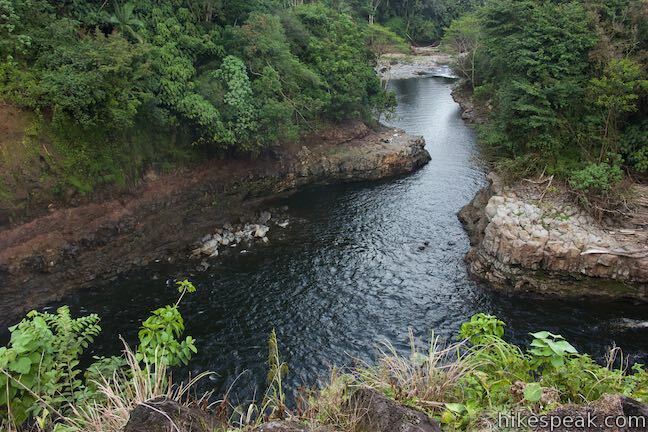 To get to Boiling Pots Lookout, continue up Rainbow Drive and reconnect with Waianuenue Avenue. Turn right and drive 1.3 miles farther up Waianuenue Avenue. Turn right onto Pe’epe’e Falls Road. Go one block and turn left into the parking area for Boiling Pots Lookout. This 4.88-mile hike plunges into fantastically-wild Waipi‘o Valley, crosses a remote black sand beach (framed by cliffs and waterfalls), and climbs to a stellar view overlooking the ocean, beach, and valley. This action-packed 1.7-mile hike explores a lava field with a lava tube shelter and impressive fishponds along a gorgeous coastline. 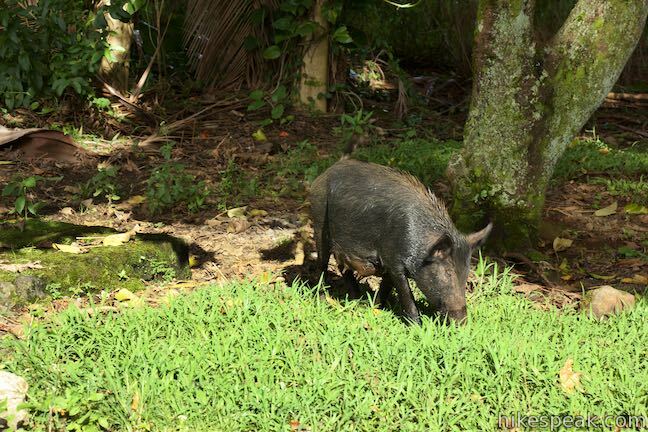 This 0.2 to 1.2-mile hike visits rare rock carvings in Puakō Petroglyph Archeological District on the west coast of the Big Island of Hawai'i. This 2-mile coastal hike in Kiholo State Park Reserve has non-stop ocean views, crossing tide pools and beaches on the way to a turquoise lagoon.